Managing a large household like Downton must have been quite trying for Mrs. Hughes. The Lord and Lady have invited the neighborhood over for a fox hunt or shoot. Whatever to serve to quench the palate? Fast forward. Your girlfriends have discovered you have the largest TV in the neighborhood and have now invited themselves over to watch Downton Abbey. 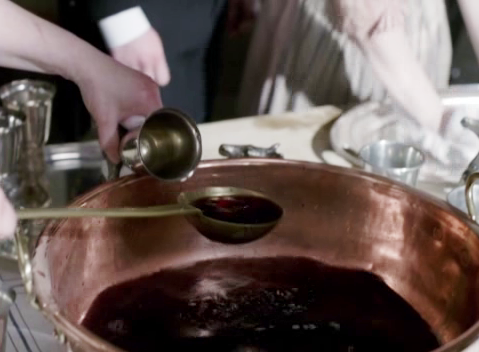 What can you serve a large crowd and still pay tribute to the early 20th century of Downton Abbey. Dig out your punch bowl (I know you have one). 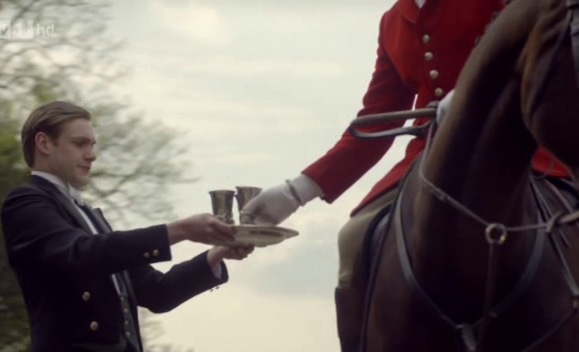 Punch has been a “go to” thirst quencher in Britain for hundreds of years. There are slight variations to the story, but essentially sailors loved the drink so much that they brought it back with them from India back in the early 17th century. From there it was introduced to other European countries and eventually made its way across the pond to American. The word “punch” comes from Hindi: “panch”, meaning five which stood for the five elements of the drink: alcohol, sugar, lemon, water, spices and tea or spices. The first punches were made with wine or brandy (Waissail), but it is not surprising that Jamaican rum came into use once the sailors got their hands on the recipe. We can thank them for the modern version of the punch. A variation of the punch is the Cup. This drink was traditionally served to send off the hunting party, but now served anywhere people want to drink in large numbers: garden parties, cricket, tennis matches, and picnics. Cups are generally lower in alcohol content than other punches and usually use wine, cider, sloe gin, or liqueurs as the base. An easy drink to prepare, Pimm’s Cup a simple mix of Pimm’s №1 (which is gin based) and lemonade. The mix ratio is 2 parts lemonade to one part Pimm’s. Add a squeeze of lemon, and then add orange, lemon and apple slices and a few slices of cucumber in the bowl. A lad by the name of James Pimm created Pimm’s in 1823, likely as a way to deal with the joy’s of farm life. Not surprisingly, it was offered as a tonic to aid digestion: a favorite marketing pitch. The drink was based on gin, and contained quinine and a secret mixture of herbs. It was served in a small tankard called a No. 1 Cup, which it is where it got it’s name. The creation was James’ ticket off the family farm. He opened a oyster bar in London, word spread, and the rest is a story of acquistion and mass production. I was introduced to Pimm’s as a young marketing professional travelling on business to London with other Canadian colleagues (marketers tend to travel in packs). Not a fan of beer we were delighted to be introduced to such a refreshing drink and ordered it where ever we went. We even brought a few bottles back to Canada with us, only to discover our local liquor stores had carried it for years. The 100th anniversary of Titanic is April 14, 2012. If you are interested in hosting your own tribute (perhaps the neighbors plan to watch Titanic on your big screen TV), I have posted menus for First Class, 2nd Class and Steerage. Perhaps the most interesting item on the First Class menu is the Punch Romaine, served as its own course, chosen to refresh the palate. 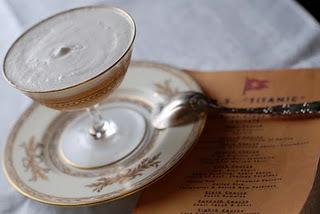 The famous french chef Escoffier created this alcoholic ice as a palate cleanser. The name is a bit confusing since punch evokes punch bowls and the types of drink we have just discussed. However, you will do well to think of Punch Romaine as a sorbet which you would want to serve in fancy dessert cups with a spoon. This is an original recipe. Thankfully many clever minds have taken up the challenge of updating this for the 21st century. I found a version with lemon serbert, raw egg whites whipped into a meringue and 2 bottles of champagne, but this version might be easier to achieve. In a large saucepan, combine the sugar and water. Cook over medium heat, stirring gently until sugar is dissolved. Bring to a boil and cook 1 minute or until syrup is clear. Remove from the heat and cool. In a blender combine the crushed ice, simple syrup, champagne, white wine, orange juice, and lemon juice. Blend until mixture is well combined. Spoon the mixture into individual dessert cups. Drizzle with rum, if desired, and garnish with orange peel. Serve immediately. Makes 8 servings, about 1 cup per serving without rum. I actually have two punch bowls, one from my dear Mom and the other from JTs dear Mom…I doubt I’ve ever used either but may during our next bash! Thanks for reminding me of them! Indeed. I gave mine a good cleaning at Christmas (where is Mr. Carson to clean my silver?!) but for some reason I didn’t serve punch. It does look stunning as a holder for our guest towels.